Mike Mackey replaces Barry Murphy at centre-forward in the only change on the Shannonsiders’ team. THE LIMERICK SIDE to face Cork in Wednesday’s Munster U21 hurling final shows one change from their semi-final win over Clare. Aaron Gillane, who top-scored with 0-14 against the Banner, is named to start but it’s believed he faces a race against time to be passed fit for the provincial decider. Mackey didn’t feature in the semi-final but did score 1-2 in Limerick’s Munster U25 final win over Clare on 4 June. Poll: Which two sides will go head-to-head in the All-Ireland hurling final? 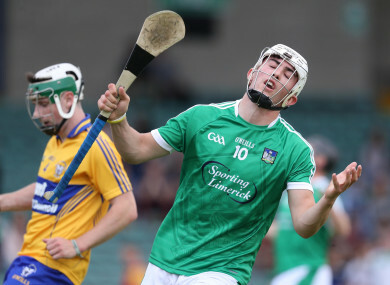 Email “Aaron Gillane an injury doubt as Limerick make one change for Munster U21 final against Cork”. Feedback on “Aaron Gillane an injury doubt as Limerick make one change for Munster U21 final against Cork”.